Cooper played an active role in Charleston civic life, serving on various boards and commissions. One of his biggest achievements was relocating the congregation from a small downtown building into a newly constructed synagogue near the state capitol in 1949.
Cooper played an active role in Charleston civic life, serving on various boards and commissions. He was named West Virginian of the Year by the Charleston Sunday Gazette-Mail in 1967 and received the Human Rights Commission Award in 1971. He was also an early supporter of the state of Israel. 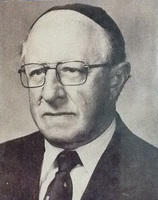 Rabbi Samuel Cooper retired from B’Nai Jacob in 1981, ending 49 years of service.